A guide for choosing the products that protect your RV’s moving parts. Motorhomes require periodic maintenance to stay in good working order. Engine oil changes are the most common procedure, but axles, the transmission, wheel bearings, and other components also must be serviced. No oil or lubricant is one-size-fits-all, so it’s important to make the right choice for each component according to the chassis manufacturer’s specifications. Lubricants are designated with American Petroleum Institute (API) or military (MIL) category numbers that identify their suitability for various applications. To choose the proper lubricant, consult your motorhome’s owners manual for the prescribed API service level, and then match the lubricant’s viscosity and rating to your vehicle’s operating environment. Two ratings apply to lubricants — viscosity and quality. Viscosity is another term for thickness. An engine is designed to utilize a specific viscosity oil for a given set of operating conditions. That’s why the Society of Automotive Engineers (SAE) determines viscosity grades according to a standardized numerical rating. Always check the owners manual to determine the proper engine oil viscosity for your vehicle. The larger the number, the heavier the oil. For example, an SAE 40 oil is heavier than an SAE 30 oil. Viscosity also denotes the ability of the oil to flow at a given temperature. As oil heats up, it thins, flows faster, and doesn’t provide the same level of lubrication as a thicker oil. If the oil is too thick, it won’t flow fast enough to lubricate critical components. SAE ratings reflect the ability of oil to flow at 210 degrees Fahrenheit. The ratings can be useful for determining how an oil will perform in summer, but they don’t take into account the low-temperature performance of the oil in winter. So, a second test is performed at 0 degrees Fahrenheit to assess oils designed for winter use and to designate a “W” rating. For example, 10W oil is thinner than 20W oil, but both are designed for winter use. The thinner 10W oil will flow better in colder temperatures. Most engine wear and tear occurs during startup when the motor is turning over but everything is cold and the pistons haven’t yet expanded to their operating tolerances. Oil begins to flow, but by the time it reaches all critical areas, the engine has been running for a few seconds. A lighter-weight oil brings the oil pressure up much faster than a thicker oil. But, once the engine is working under a heavy load, the oil becomes too thin to provide adequate lubrication. So, in the case of a single-viscosity oil, it is better to opt for a heavy oil and live with the startup wear than to use a lighter oil and pay the penalty when the engine is working really hard. Multiviscosity oils eliminate that dilemma. A multiviscosity oil has two ratings. For example, a 10W-30 oil provides the cold-temperature performance of a 10W winter oil, yet it retains the high-temperature performance of an SAE 30 summer oil once the engine reaches its operating temperature. This offers the best of both worlds and does a better job of protecting your engine at both startup and when under load. Oil quality is determined by its chemical makeup and its imbedded additives. Base oils account for about 85 to 90 percent of the formulation. The remainder consists of additives that provide full protection, including antioxidants, viscosity modifiers, dispersants, detergents, antiwear agents, rust and corrosion inhibitors, antifoam agents, and a host of others. API established its rating system to identify the quality of every oil. Both API and SAE ratings are marked on every container. Consult the vehicle’s owners manual for the minimum API rating specified for your engine. You always can exceed the API ratings and use a better grade oil, but never drop below the minimum API rating. Engine oil lubricates moving parts such as bearing surfaces that are under compression; the oil’s detergent and additives help clean the engine and trap combustion deposits. An engine’s owners manual specifies the minimum API oil rating that should be used. Gasoline engines use the “S” series of ratings, while diesel engines use the “C” series of ratings. Diesel engines have an API service classification such as CJ-4. The “C” means “commercial,” or to make it easy to remember, relate it to “compression ignition.” So, every oil designed for use in heavy-duty diesel engines begins with a “C.” The next letter, which in this example is “J,” designates the latest specification. When a new specification comes out, the letter increases. For example, an API CJ-4 spec is a better quality oil than an API CI-4 and can be used whenever API CI-4 oil is specified. It’s always okay to use a higher letter than what an engine’s specs require; the engine’s specification is a minimum requirement. The “4” at the end means that the oil is designed for a four-stroke engine. Gasoline engines have different requirements for lubricating oils than diesels. The API service classifications for gas engines begin with an “S,” followed by a second letter. The “S” stands for “service,” or relate it to “spark ignition,” while the second letter designates the service classification. Just as with oils designed for diesel engines, a letter that comes later in the alphabet designates a better oil, so an API service classification of “SM” is better than an API service classification of “SJ.” Oils used in gas engines can exceed the required minimum service classification but should never fall short of it. Owners of motorhomes with diesel engines built to emissions standards adopted by the U.S. Environmental Protection Agency in 2007 must be sure to choose API CJ-4 oil or better. Here’s why: Motorhome engines built to such standards generally began appearing in the 2008 model year and were equipped with diesel particulate filters. The filters are susceptible to fouling by contaminants such as sulfur, so the engines require ultra-low-sulfur diesel (ULSD) fuel with less than 500 parts per million of sulfur. Diesel particulate filters also are fouled by zinc, which was present as an antiwear additive in motor oils. As a result, a new motor oil was formulated — API CJ-4 — with zinc replaced by other antiwear compounds. In 2016, API approved new CK-4 oils to address varying needs of engine technologies and to help diesel engine manufacturers meet more stringent emissions requirements. Conventional motor oil comes from the ground and contains impurities such as sulfur, wax, and asphalt. In addition, the size of the oil molecules are fairly inconsistent. On the other hand, creating synthetic oil in controlled laboratory conditions eliminates impurities and results in molecules that are consistent in size and shape. Because synthetic oil is created from scratch, it can have just about any properties the chemist chooses. 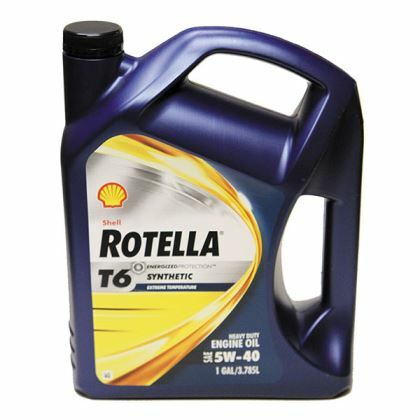 Synthetic oil has a lower pour point (the temperature at which it loses its flow characteristics) than conventional oil, which greatly improves cold-weather performance without diminishing high-end capability. It’s common to find a 5W-40 synthetic oil that can replace a conventional 15W-40 oil. Oil boils if it gets hot enough, and it vaporizes and hardens into carbon deposits once it hits hot spots in the engine. One susceptible area is immediately above the top piston ring, where carbon buildup accelerates wear on the cylinder wall. Another area is the turbocharger oil galleries, where oil breaks down and produces solid residue — coke — that plugs critical passages. Restricted flow can lead to premature turbocharger failure. Conventional oil tends to break down at about 250 degrees, but synthetics are good to 290 degrees, which minimizes coking and increases the life of the turbocharger. Manufacturers of synthetic oil claim that service intervals can be extended when compared to conventional oil, but not every engine manufacturer allows this; therefore, you may not be able to do that without voiding the engine’s warranty. Synthetic oil costs more than conventional oil, so for motorhome owners who typically change their oil based on time intervals rather than mileage, the money saved by extending those intervals may or may not apply. However, synthetic oil offers better engine protection. Synthetics, because of their lower pour point, offer an advantage in cold starts and cold-weather operation. And the higher boiling point of synthetic oil offers additional protection when the engine is working especially hard. Automatic transmission fluid (ATF) lubricates fast-turning shafts and clutch packs to transfer power through a complex system of servos, pumps, and fluid couplings. The fluid is the primary method of cooling the transmission. SAE viscosity and API ratings do not apply, so a different rating system is used. If you have a Type B or C gas-powered motorhome, chances are it has a Ford or Chevy transmission. Such transmissions utilize the Dexron or Mercon variants of ATF that are available at auto parts stores. Coaches built on the Mercedes-Benz Sprinter chassis most likely use the MB 236.x series of transmission fluids, such as Shell’s 134 MB236.14. TranSynd, a synthetic ATF manufactured by Castrol for Allison Transmission, is rated as meeting the MB236.91 specification. Most Type A motorhomes with diesel engines are equipped with Allison automatic transmissions. Such transmissions can be filled with the same Dexron fluid that a Chevy pickup truck uses. Although it meets Allison’s TES-389 specification, Dexron is rarely used anymore. To achieve the best protection and extend service intervals, synthetic fluid is highly recommended. In fact, sometime during the 2004 model year, both Freightliner and Spartan began shipping chassis prefilled with Allison’s synthetic TranSynd. Synthetic fluid raises the temperature at which fluid will burn during hard use. 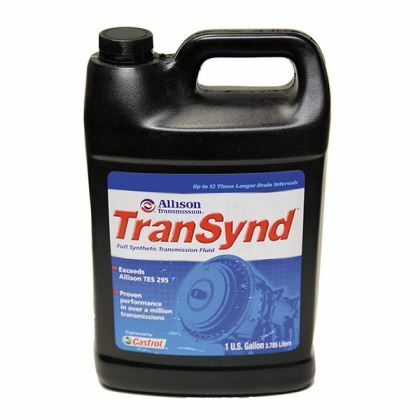 In addition to TranSynd, Allison has tested other synthetic fluids and identified brands that are compatible with Allison transmissions. The list of TES 295-approved fluids can be found at www.allisontransmission.com/parts-service/approved-fluids. Any automatic transmission fluid approved by Allison qualifies for the extended service intervals in the company’s service schedules. Gear lubricants are applied to high-load areas that experience friction during motion, such as rear axles and wheel bearings. 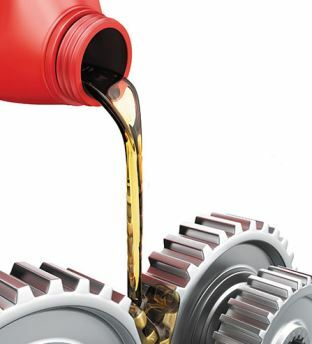 Gear lube is heavier than motor oil; its viscosity ranges from SAE 75 to SAE 140. It must function under high operating temperatures and loads. 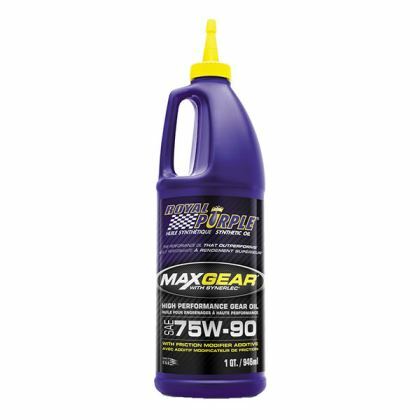 Gear lube generally falls into two categories — standard duty or extreme duty. Most situations require basic 80W-90 gear lube, which is used on wheel bearings, gear cases, and rear axle ring and pinion gear sets. Limited-slip differentials, when used in some automotive applications, add a bit of complexity to the lubricant requirement. Limited-slip differentials utilize clutch plates to tie both wheels together for improved traction yet allow the plates to slip when turning corners. In some cases, the gear lube must have an additive, or a gear lube specially designed to work in limited-slip applications must be used. If a vehicle is equipped with a limited-slip differential, check the owners manual to determine the requirements. Gear lube designed for limited-slip applications also can be used in standard open differentials. More protection sometimes is needed for heavy loads or extreme conditions, so a manufacturer may require a heavier gear lube, such as SAE 140. In such cases, a synthetic gear lube is ideal. Many come with an SAE 75W-140 viscosity rating. Such gear lube flows well in low temperatures yet still functions when things get hot. A synthetic 75W-140 gear lube is the best protection for an axle or gearbox, such as a cooling fan jackshaft. Synthetics are also less prone to foaming than conventional gear lubes. The accompanying chart illustrates typical low temperature (pour point) and high temperature (flash point) properties of gear lubes. In diesel pushers, hydraulic fluid often is used in power steering units and hydraulic fan motors, which are commonly found on motorhomes equipped with a side radiator. The motor and the power steering system are driven by a hydraulic pump that is mounted on the engine and fed by a hydraulic fluid reservoir. Hydraulic fluid must be clean and nonfoaming. 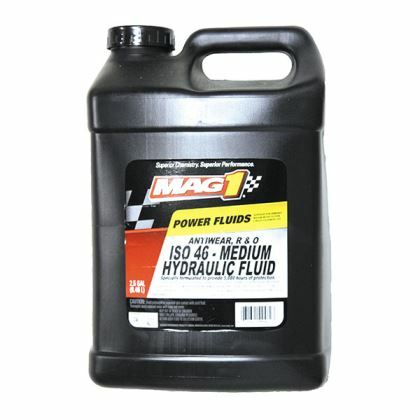 Hydraulic fluid generally is the AW32 or AW46 formula. AW stands for “antiwear” and is strictly used to designate hydraulic fluids. The 32 and 46 represent the weight of the fluid; higher numbers indicate a heavier fluid. AW46 is most often used in motorhomes. Keeping the fluid cool and free from moisture or dirt is critical, so filter and fluid changes are part of a routine service schedule. You might think grease is grease, but there’s quite a bit of difference among formulations and their applications. Matching the correct grease to the lubrication requirements of components will increase the longevity of those parts. Grease viscosity is rated by the National Lubricating Grease Institute, or NLGI. The most popular chassis grease is NLGI 2, which works for 90 percent of automotive applications and can be found at auto parts stores. NLGI 1 is thinner; it melts and flows at a lower temperature. NLGI 3, a stiff grease used when extreme heat is encountered, has no real application in the RV industry. Grease consists of lubricating fluid, performance-enhancing additives, and thickener. The lubricating fluid makes up the majority of the formulation and can be petroleum-based oil, vegetable oil, or any synthetic lubricating fluid. The thickener separates grease from oil or other liquid lubricants and makes the product semisolid rather than liquid. Plain lithium grease works well for wheel bearings, but it is marginal for driveshaft universal joints and front-end components, which rely on a thin layer of grease to separate two metal surfaces. If enough force is applied to the two surfaces, such grease can compress and slide away, allowing metal-to-metal contact and increased wear. Also, when surfaces pull apart from each other, the grease film can fall away rather than stick to the surfaces. Fortunately, advanced lithium greases have additives that improve upon basic lithium grease. They cost more but are well worth it. If you place a small wad of basic lithium grease between your thumb and index finger and squeeze, much of the grease oozes out, but a small layer remains. When you pull your finger and thumb apart, the grease breaks free and leaves a slight film on your fingertips. Each time you squeeze and release, you lose more of the lubricant until eventually none is left. Repeating the above test using advanced lithium grease will demonstrate its superior tackiness. The grease tends to stick to your fingertips. It’s more difficult to pull your fingers apart, and when you do, the grease stretches like strings. Lucas Oil’s Red “N” Tacky grease exhibits these characteristics. It stays in place better than a less expensive lithium grease. When two metal parts rub together, which is typical of a ball joint or tie-rod end, grease tends to squish out from between the surfaces. To reduce wear, the grease must stay in place. That’s where moly grease comes in. Typically, it contains 5 percent molybdenum disulfide, which is an inorganic compound that consists of small round particles that act like miniature ball bearings. They aren’t crushed when under pressure. Moly won’t scratch or damage metal surfaces. It prevents metal-to-metal contact and allows the grease to filter in and around the moly particles to cool and lubricate components. Moly grease typically is black and messy, but it is excellent for front-end work and universal joints. Moly grease is not recommended for wheel bearings, because the particles tend to force the rollers away from the races, which tightens the bearing clearance and increases heat. For wheel bearings, it’s best to use a more fibrous general-purpose or tacky grease. Grease that is designed for wheel bearings generally will meet the NLGI GC-LB or SAE J310 specifications. Many lubricant suppliers offer synthetic chassis grease. Synthetics are great for extreme temperatures, but the vast majority of RV owners won’t realize those benefits because they don’t encounter such conditions. Many excellent conventional greases are available. My favorite is lithium grease with moly and excellent tacky properties. Examples include Schaeffer’s 221 Moly Ultra; Shell Gadus S3 V460D 2; Mobil Centaur Moly; and Valvoline Palladium grease. They resist water penetration, hold up well to heat, stay in place, and resist shock loads. I’ve been using this type of grease for a long time in numerous vehicles. The longevity of the universal joint and front end is remarkable. 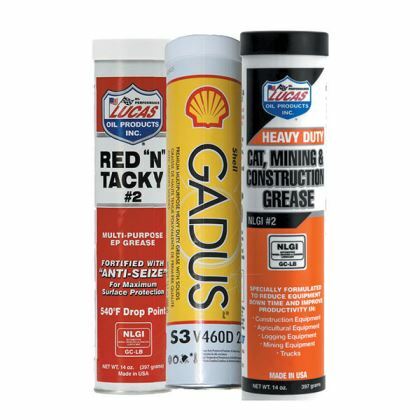 Many greases are available with improved load-carrying capacity, even non-moly greases. Such greases carry the EP label, which stands for extreme pressure. You should not use moly grease when lubricating automatic slack adjusters, a component of air drum brakes. Slack adjusters are designed to self-adjust as they’re used, but some friction is required for that feature to work properly. Moly grease makes the slack adjusters too slippery. Buy a tube of inexpensive grease and load it in a second grease gun used strictly for the slack adjusters on drum brakes. A proper maintenance cycle for your motorhome revolves around following the recommended service schedule and matching every component with the correct lubricant. The owners manual specifies the minimum requirements, but keep in mind that exceeding those specs with a higher-quality lubricant generally will yield greater longevity. Taking proper care of your coach will save you money in the long run and greatly improve the odds of trouble-free operation.